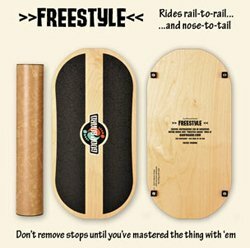 The Goofboard Freestyle is a unique balance board that offers up some different ways to work on your balance in the summer. It’s very much like the Indo Board except you can turn it sideways and act like you are on a long board. This is more for someone who likes to long board as much as they snowboard. If you are that person then this is an affordable option for those that like to practice riding the nose as well as riding how traditional boards work. We try to get as many images of the Goofboard Freestyle, but forgive us if they're not all there.